The Long Version: Another Christmas gift that, much like the previously reviewed Open It! household multi-tool, actually works and is worth the price. But this little gadget really does slice open envelopes and all types of consumer packaging, with no danger of drawing blood. Perfect for the clumsy people on your gift list. It's ceramic blade is as sharp as an ExActo knife, but for some reason won't cut skin. I suppose if you really tried you might manage some damage but in my casual testing it's been safe. The iSlice retails around here for $5US and I have to think that's a fair price. Especially since the designers went the extra mile and made it harder to lose in a drawer by making the metal point magnetic. 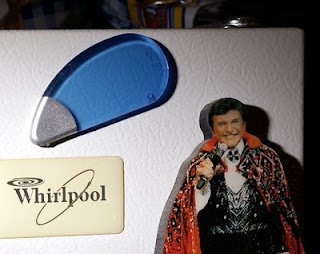 Although shown stuck to our refrigerator (with the crooked logo and Liberace) I keep mine stuck to my desk lamp for instant grab & slice action. The name bothers me because it's yet another example of the mindless marketing people that ape the latest craze--in this case iPods. I'm surprised there isn't a toilet tissue called iWipe. A few years ago everything was Mywhatever due to the MySpace phenomenon. And in the USA, every political scandal gets the word gate tacked-on the end after the infamous Watergate break-ins of the 1970s. Noooo, 'gate' was part of the name of the Watergate hotel, not a suffix that means scandal. Journalists are a big disappointment because it appears they don't think for themselves. Failed ad copy writers perhaps? The iSlice works, makes a nice little gift, and is worth the price. It uses modern ceramic blade technology so supposedly the edge won't get dull. Today I used it to slice open the plastic wrap on a roll of paper towels and it did the job without cutting into the product, which was a pleasant surprise. With envelopes I have managed to cut through the first layer of paper inside, but then I don't get much mail and use a switchblade as a letter opener anyway. I would probably never buy something like this for myself, but having received it as a gift find that I use it often and am impressed every time.